When I first found out we were going to review 2 Units from Moving Beyond the Page we were excited, but once we opened our box from them we were overjoyed. We received A Girl Named Disaster as an online literature unit and Africa Today as a physical social studies unit. Moving Beyond the Page offers full comprehensive curriculum packages for students 4-14. The curriculum packages contain Language Arts, Writing, Science, and Social Studies for all levels with Math for ages 5-9. Each unit can be purchased individually. The units come as a spiral bound workbook or as a printable online unit. We received one physical unit and one online unit. We were allowed to chose which ones we wanted to study so I asked my girls what sounded good for the summer. They chose A Girl Named Disaster as our online literature unit, so we went ahead and chose Africa Today as a physical Social Studies unit to go along with it. 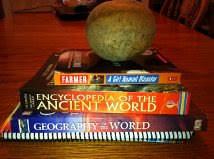 We received the book titled A Girl Named Disaster and access to the online curriculum unit, Africa Today workbook, Geography Of the World, an Encyclopedia of the Ancient World, and a Cannonball Gourd. The Literature Unit for A Girl Named Disaster comes with the curriculum, the book, and the cannonball gourd. They can be purchased as a set for $23.92 for online access to the curriculum or $27.98 for the physical workbook. This Language Arts curriculum can be completed in 19 days and is recommended for ages 11-13. There is a complete list of prerequisites and summary of skills to see if your child is ready for this unit. A Girl Named Disaster, $6.99 ~ This 310 page book is a story about an 11 year old girl named Nhamo who lives in a traditional African village in Mozambique in 1981. She doesn't really fit in with the rest of the tribe and is only really liked by her grandmother. For her own safety her grandmother sends her away on what should be a short trip on the river. Instead it turns into a year-long adventure as Nhamo faces challenges she never imagined. She has to be courageous as she enters into a world she never knew existed. A Girl Named Disaster Language Arts curriculum online $12.93 ~ There are 12 lessons in this unit with each one having 3 parts. Into~ Includes an introduction of the reading material for the day, a list of items needed, things to think about, things to know, and a Reading and Questions section that tells the child what to look for while they are reading that they may need for their written work. Activities~ Some of the activities include map work, coloring flags, making an African Quilt, editing sentences, History, and more. Conclusion~ Here we have Life Application with discussion questions and things to review with your child. The online version is very easy to navigate for the parent or the child. Here is the screen that contains your units. We only have one online unit. After clicking on your unit you will have access to all the lessons. Once a lesson is completed it is checked off and marked out. You can go back to any lesson that has already been completed as long as you still have access to your unit. This is a sample of the unit. Each lesson has three sections that are easily located in the tabs. Africa Today is a Social Studies Unit is for ages 11-13 and can be completed in 19 days. This Social Studies package can be purchased as a physical book for $56.97 or with online access $52.91. It includes Africa Today workbook, Geography of the World, and an Encyclopedia of the Ancient World. Geography of the World: The Essential Family Guide To Geography and Culture, $19.99~ This is a 304 page 8 1/2" X 11" softcover book. It covers each continent & describes the people who live there. Each country or groups of countries then have their own maps showing its cities, towns, and geographical features. The Usborne Internet-Linked Encyclopedia of the Ancient World, $19.99~ This 7 1/2 X 9 1/2 colored softcover book has 400 pages. This beautifully illustrated encyclopedia covers the first farmers of the Middle East to the mighty empires in Mesopotamia, Egypt, Greece and Rome. Africa Today Social Studies workbook $16.99, online $12.93~ The 200 page workbook is spiral bound and divided into 7 lessons and a Final Project. It starts with an overview of Africa and continues on through each major section. The student will create a wall map of Africa, keep a journal of current events, and explore African folktales. Our units were suggested for kids ages 11-13. The online units can be printed and used with more than one child, but the workbook is consumable and copyrighted so each student will need their own workbook. Amber is 12, Delaney is 11, and Alaina is 8, they worked on the units together with Amber using the consumable workbook. I read A Girl Named Disaster out loud during our family read aloud time. We answered and discussed the questions out loud, Amber & Delaney worked on the writing assignments, and they all three enjoyed the activities. They liked coloring the flags and creating the Guidebook to African Animals the best. Amber used the Africa Today workbook, but I included all three of them in the discussions and research. Amber really liked that there are a variety of projects included in this unit. She loves maps & she really likes to write, but she also still enjoys other activities. She loved creating her wall map throughout the unit & liked the charts, mini books, and creating a brochure. The additional books that are required for this unit are so nice. They include beautiful photos and illustrations that make research enjoyable and come alive for the unit. My girls also liked just flipping through the books to look at the pictures and read things that caught they interest. We were given an online unit and a physical unit, they both have their pros and their cons. We are a book loving family in any form and we really like the spiral workbook. The pages can be completely flipped to the back to make it easier to use. I just feel more organized having a book, and its easier to use it anywhere in the house or if I include everyone in the discussion questions and we move to the couch. The downfall is you have to purchase additional worksheets for each child, so it may become more expensive. The online unit was very easy to navigate, it is cheaper and the worksheets can be printed for all the children within your family. Once you activate your online unit you will have access to it for 90 days. Customer service is very accommodating and will extend your unit if you need more time. You may purchase all your units at once and wait to activate them when you are ready. My girls knew a little about Africa when we started our units, but they knew very little about the cultural traditions of the tribes. It was an eye opener to them to see how different people still live in other cultures when our society is so modernized. Moving Beyond the Page has so much to offer and we enjoyed our units so much we are looking forward to purchasing more in the future. My girls have their eye on a couple of science units that they would love to use.